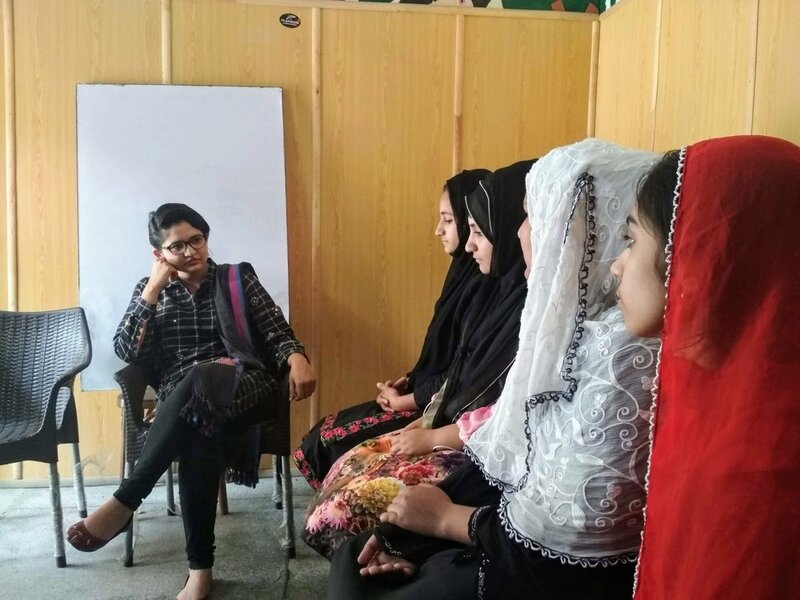 Khud Initiative is currently supporting local young women entrepreneurs at two of its collaborating institutions to empower them and help them master soft skills for their startups. Motivating these underprivileged yet talented women to come everyday fighting against all odds can prove to be quite a challenge. For this, we try to keep up the spirit through motivational videos and various other activities. This time around we wanted to show these young women, a live example of how far hard work and courage can take a woman, even in an under-represented (tech) space of Pakistan. We invited Fatima Rizwan, founder & CEO of TechJuice- Pakistan’s leading technology and startup related platform. Fatima was kind enough to accept the invitation and managed to visit both our collaborating institutions, despite Lahore’s menacing traffic. Fatima had an interactive session with all the girls. She reassured them that hard work is always rewarded one way or the other. She explained how her own journey started with small freelance projects and discussed the available platforms these girls can benefit from by creating their portfolios and finding projects. She was very impressed with the work done by these girls- despite the challenges they face. The girls opened up about their daily difficulties, while Fatima offered them tips that could help make the journey a little easier. The girls also had their own set of interesting questions regarding Fatima’s journey and her startup, after which the session concluded. The session ended on a very high morale and discussions on future possibilities of collaborations between Khud Initiative and TechJuice. We were honored to host Dr. Ahmed Arshad, the Vice Chancellor of LUMS, for Demo Day. Children from our edtech programs across the 4 schools in Lahore showcased their efforts in cutting edge digital areas. Starting with younger children who were beginning their journey in digital literacy to young women entrepreneurs. Dr. Arshad appreciated Khud’s “tremendous vision” of trying to tackle Pakistan’s education crises in a disruptive way. 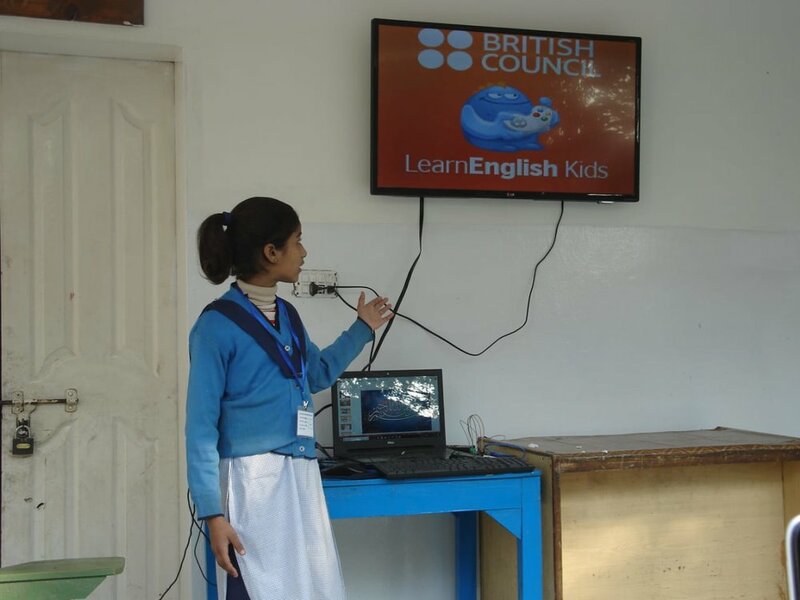 Given his background in Educational Psychology, he was particularly impressed how young children were able to confidently present what they had learned via Khud’s edtech programs. Dr. Arshad and other guests noted how university students and in some cases professionals, can’t present with such confidence! The children in our programs are disadvantaged with limited, if any, access to technology. But, they are just like other children in that they have the curiosity and an eagerness to learn. Tapping into that is the fuel that propels the children through Khud’s edtech program towards digital literacy. After acquiring digital skills, children can self-learn other more advanced areas and uplift themselves and their families out of poverty. In that spirit, Khud is establishing “mini-startups” to facilitate the journey. A group of young women, who had never heard the concept of a blog, are now running an automation blog: Autome.me. We are wishing them success! In the Q&A session, the students were extremely excited to ask Dr. Arshad about possible future collaborations with LUMS. Students of Grade 7 and 8 inquired the best approach in to get admitted to LUMS as well as other leading universities in Pakistan. Dr. Arshad explained how National Outreach Program caters to such underprivileged yet brilliant students of Pakistan. The children appreciated that there is a path for them to also get a world class education. Four years into Khud’s journey, we are now very excited to formalize our edtech programs and scale. We need all the help - please volunteer with or support us financially. Despite lack of opportunities, our women have been able to achieve beyond expectations. For socio-economic welfare of any country, it is vital to empower women by providing them with the needed opportunities. Future is all about digitalization and the women of Pakistan have a significant part to play in it, if we ought to succeed as a nation. A couple of years ago, Khud provided a platform in one of our collaborating schools for girls from low-income communities. The girls not only learned the relevant digital skills but practically implemented those by developing a fashion news aggregator website, called Aletere. The website was a huge success, garnering about 150,000-page views. However, due to some logistical issues, the project could not be continued for long. We took that as a learning experience and were back at it, with renewed optimism and an enhanced plan. We now have an all-girls team, working on an automation blog that is focused on Artificial Intelligence, Data and Robotics. The team is divided into groups of three, to manage tasks respectively. Despite the fact that some of these girls used computers for the first time, six months ago, they have managed to post 485 articles. Automeme has had 4000-page views and over 2,000 followers on twitter so far. The motivation and skills these girls have demonstrated in this project is applaudable. And we are extremely proud of the progress they have shown so far. Stay tuned for more interesting updates from this amazing team! “If your plan is for one-year, plant rice. If your plan is for ten years, plant trees. If your plan is for one hundred years, educate children.” ― Confucius. Pakistan’s education system is in crises- marred by several issues- from lack of schools to the deficit of teachers. Wherever there are schools and teachers, the absence of basic infrastructure and quality of teachers hinder any real progress. Despite many challenges, Khud is marching ahead with its vision. We have equipped around 500 marginalized students with digital education and introduced them to the latest technologies. EdTech has always been the core of our vision, while importance has always been laid on its delivery. We have departed from lecture-based pedagogy towards project-based learning. The problem with the old approach is that most students rote-learn instead of grasping the actual concepts. When it comes to executing those concepts, the students usually forget what had been taught altogether. We have achieved great results with the new approach, which was practically exhibited on the demo day. Currently, we are working on improving and tailoring our digital curricula to satisfy our students’ needs. Our goal is to develop these self-executable digital curricula, bypassing the need of technical teachers, and making it public by 15th August 2019, so that other schools can benefit as well. Khud students shine at TechJuice python bootcamp! It is not every day that you hear grade 7 kids participating in a university level bootcamp- especially those hailing from the underprivileged strata of the society. On 19th January, 2019 the young stars from Khud raised many an eyebrow when they participated in the bootcamp organized by TechJuice at the University of Central Punjab. The one-day bootcamp on Python covered an intense 4-hour curriculum designed to give participants complete, basic programming skills to use in their studies or workplaces. The bootcamp featured speakers and mentors from Arbisoft, one of the most prominent software houses in Pakistan. Despite their young age, our kids were able to successfully grasp most of the python related concepts delivered at the bootcamp. This was largely possible due to their training in the programming course that was part of Khud’s digital curriculum. The mentors were very happy to see the excitement and confidence our students had shown. The bootcamp successfully managed to provide the much-needed exposure to the kids. We would like to thank Techjuice for letting our kids be a part of this event. And wish them good luck with such future initiatives and look forward to continue participating in such events and in greater numbers. 25th of December 2018 is the day we have all been waiting for. The day when all of the Khud family, including students, teachers, volunteers, mentors and patrons got together for an annual Demo Day! All of our collaborating schools made conveyance and arrangements for their respective students to assist participation in the Demo Day. The event not only provided students a platform to showcase and present their progress and projects but also provided a much-needed exposure. Many renowned names from the education sector and tech industries attended the event. Besides applauding the students for the great show, they also provided them with their valuable feedback. The participating students invested a lot of effort in preparing the presentations and they were able to put up a marvelous show which was appreciated by all the guests. It was very heartwarming to see the underprivileged children discussing such complex ideas and future technologies. The whole event successfully established the fact that these students have a great potential and better opportunities can bring out the best in them. Here’s to another year’s journey where we aim to equip more and more youth from the underprivileged areas with digital skills so that they may prepare themselves for the jobs in the future! The basic reason of poor education system in under-developed countries is the lack, or an absolute absence, of good teachers. Every new phase of information technology has predicted that books will become obsolete. Books, however, have always proven to be resilient! But digital education can surely complement them and if executed properly can do wonders, especially in a country like ours. Paying more to teachers in a hope to get better educators is unfortunately not a practical solution. In such a scenario, EdTech can be our country’s best bet and we, at Khud, are set out on a mission to prove that. Through this, we use our funds on gathering resources for digital education, rather than spending them on teachers. It doesn’t mean simply dumping a bunch of computers in schools will make the children learn everything. What we actually do is to provide our collaborating schools with self-explanatory digital curriculum that can be used by the students with little or no aid from teachers. Many wonder how a system based on technology can be successfully executed in a country which mostly doesn’t even have the basic infrastructure. But here we are, going forward with our mission and making impact despite all the challenges. Our goal, however, has never been to replace books and teachers altogether. There are some great teachers that believe in our cause and work with us selflessly. EdTech actually allows us to complement their hard-work and enables us to package and scale the delivery of education on a level that is simply not possible via traditional education system. Sustaining in society with a disability is always tough. Sustaining in society with a disability is always tough. And lack of opportunities make it even tougher. But Zahra has never let that hold her back. A student herself, she has always looked for opportunities that could help her make contributions to the society. Recently, she found one such opportunity in the form of internship at Khud, where she developed a basic digital curriculum for “Intro to Biology”, based on the content available on the internet. Zahra was tasked to compile the curriculum such that it was simple as well as engaging and fun for the students and that it needed little or no help of a technical teacher to be executed. Despite her physical confinements, Zahra will be able to impact the lives of so many students. Hundreds of underprivileged students will be able to benefit from her work and knowledge, despite never meeting her in person. This could have only been possible in today’s age, with the use of technology. There can be no better validation of Khud’s vision. And we, at Khud, could not be prouder. Students at Zahoor School Going Techie! Earlier this year, the IT lab at Zahoor School got a major upgrade in the form of a bunch of new computers installed in it. As expected, the impact that this addition created has been great. The students continued on with their courses as well as some new students were taken on board now that there were more computers. The result was that our students are making progress by leaps and bounds. Some of their work includes changing background , creating hologram effect as well as using 3D camera Motion Tracker tool to attach different compositions in the given videos. It makes us swell with pride to see our efforts bring fruition through the little achievements of our students like this. Because we believe it is small steps like these that will lead them to do great things in the future and that is when our work will be done. But until then, we will keep doing our best to equip students with digital skills of today.